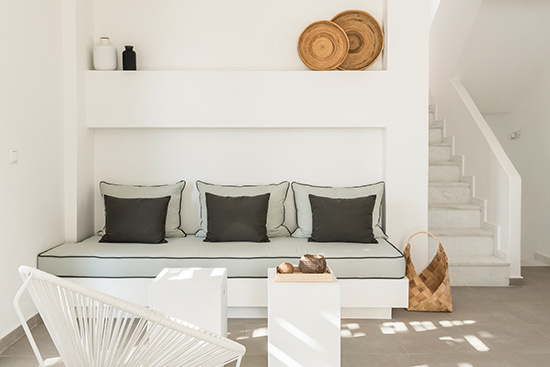 The seven individually styled villas mix an awe-inspiring Cycladic architecture with contemporary sleekness and modern-day comforts. White washed buildings, simplistic in form, sea facing terraces and decorating windows to reduce direct heat from the sun are located directly on the sandy beach. The all white interiors are contemporary and elegant allowing natural light and fresh sea breeze to flood in whilst offering every conceivable comfort and amenity. Minimal chic design blends with super bright and ultra-cozy interiors. Experience modern island style with a traditional touch with built in furniture, concrete screed bathrooms and natural materials like white linen beds. Alfresco dining areas are shaded by ample pergolas while airy bedrooms open to private sun-kissed terraces and balconies. Fall asleep to the sound of the sea or feel the breeze first thing in the morning. The inviting interior and exterior spaces provide a flawless restful ambience of a private home. Eneos Beach Villas are stunning architecturally designed villas that offer the very best of Mediterranean living. Sunny terraces, endless sea views, cloud less blue sky, Mediterranean climate, the clear and turquoise seawater, the sandy beach, the fresh sea breeze offer unique Mediterranean feeling. Start your day with morning jogging barefoot on the sand beach of Agios Sostis. Enjoy the sun swimming and lying on your sunbed. 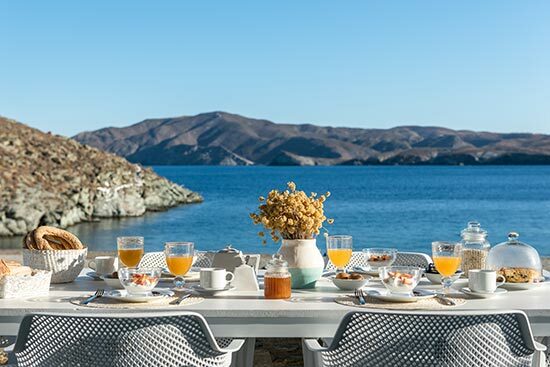 Taste deliciously Mediterranean cuisine at your villa trying local products and recipes or at the fish restaurants and tavernas that provide real Mediterranean flavors from natural ingredients like olive oil, fresh vegetables, fresh fish that is perfect for summer eating. Eneos Beach Villas will travel your senses in the Mediterranean lifestyle. Enjoy ultimate privacy during your stay in villas. The villas spread out over various levels and have great spaces allowing overall comfort and chance to all guests to relax. Most of the bedrooms open to private terraces or balconies, which face the sea. 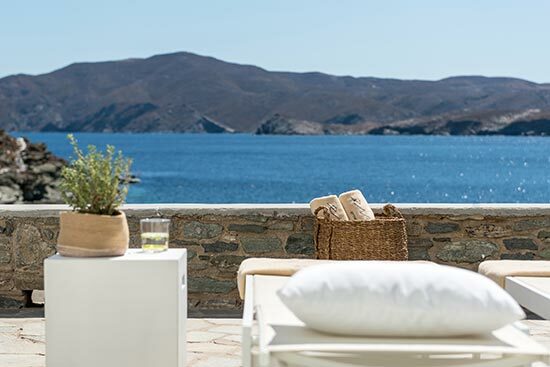 Eneos Beach Villas is steps from the sand and all villas have private beach access. 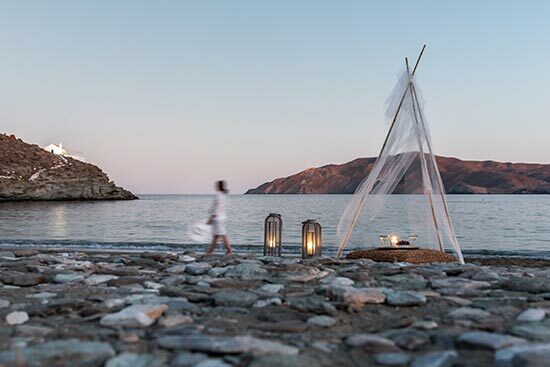 This retreat is set on a perfectly private and serene location despite the fact that is just a few minutes’ drive away from Loutra, the most popular summer resort in Kythnos, surrounding from restaurants and bars. If you are seeking a vacation for family and friends, Eneos Beach Villas provides the perfect venue, offering luxury accommodation in a truly striking and private setting. Stay connected with social media and your favorite apps. Ease up and keep in touch with your family and friends. Enjoy the island life in an idyllically laid back and absolutely sublime retreat and share unique vacation moments.